With so many choices in a Tape configuration from acrylic, silicone, rubber-based, single or double side, coated, un-coated etc.. We thrive at the challenge of helping you work through these options for your next project. We have an array of different choices to help you define these decisions, all while giving you the option of having us hold Inventory for you. Below are some of our offerings and where they are commonly used. All though the list is not all inclusive so please contact us for just a quick question or to discuss your new project - we are listening!! Will offer a clean removal with no adhesive residue, tear and break resistant, highly resistant to heat and chemicals. Used in printed circuit board production. This tape is transparent, and allows observation of the circuit boards during their processing. 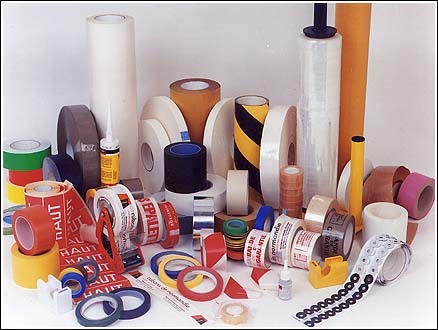 Offered in a variety or carriers with different adhesive applied. These can be double-coated or single, have a polyester, film or paper carrier. Available with a high temperature adhesive. Supplied in a non-tacky dry form which is then activated with a combination of pressure and heat. This film will function as an end-product component as well as a processing aid. When your application exceeds the range of polyester film. Uses include cable and wire wrapping. Thermal and electrical insulation as well.